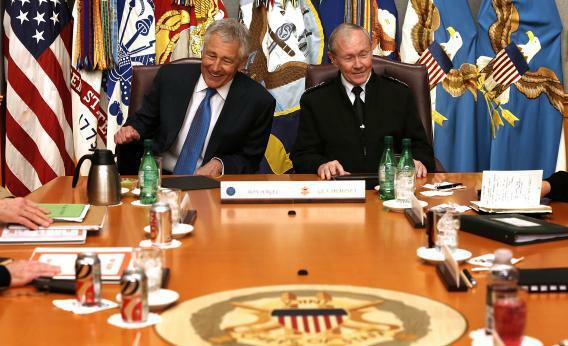 U.S. Secretary of Defense Chuck Hagel (L) and Chairman of the Joint Chiefs of Staff General Martin Dempsey (R) share a moment during a meeting at the Joint Chiefs Conference Room, also known as the ‘tank,’ March 1, 2013 at the Pentagon in Arlington, Virginia. The annual AIPAC policy conference is wrapping up now, and I’ve escaped the hypertrophied Washington Convention Center with this report. Is there anger about AIPAC’s refusal to oppose Chuck Hagel’s nomination? Some, sure. But the rank-and-file understand the long game, and think that ducking the fight shored up AIPAC’s credibility in its day-to-day lobbying. The Obama campaign’s message to Jewish voters—the ones who considered bolting over Israel—was basically, “Look at all we did to fund the Iron Dome missile defense system!” And that’s basically been grafted onto AIPAC, as the message of the conference and the proof of American-Israeli friendship.